In short, this is the problem: You try to go invisible in chat from your gmail and it says: “Oops! You are not invisible because you’re logged into Google Talk from another client, device, or location that doesn’t support invisibility.” No matter what you do – from signing out of all the devices/clients/locations to resetting your google account password, you STILL see the ‘oops’! Turns out that there are a number of reasons why your chat suddenly behaves this way. But the main point is that there is another (or are many other) session(s) of your chat active at that particular time. This spooky session(s) might be from a talk app on your mobile phone, the Hangout app, stand-alone Gtalk software, IM clients such as eBuddy, Trillian, etc. The idea is to end those invisible session(s), but you have no idea where that session is, right? Don’t worry, there is a way to find that and it takes as much time as it will take you to download around 9Mb. 1. 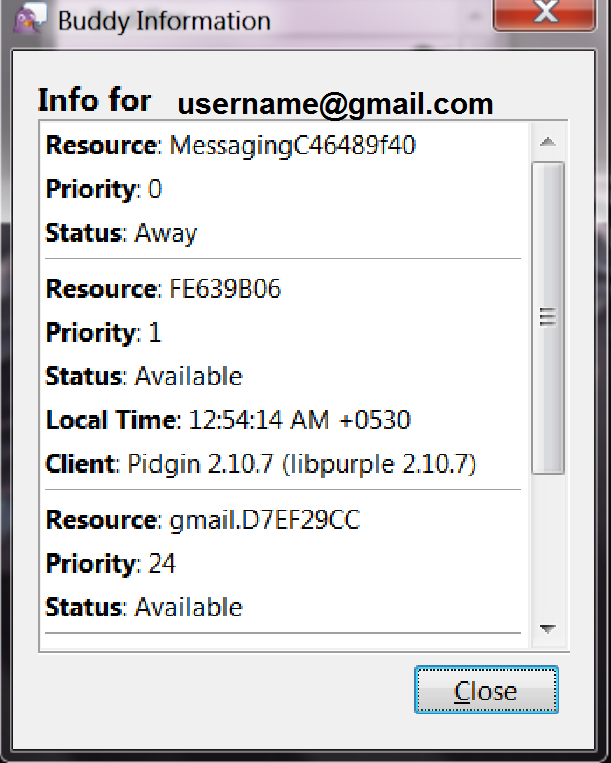 Go ahead download pidgin, a third-party IM client and install it. 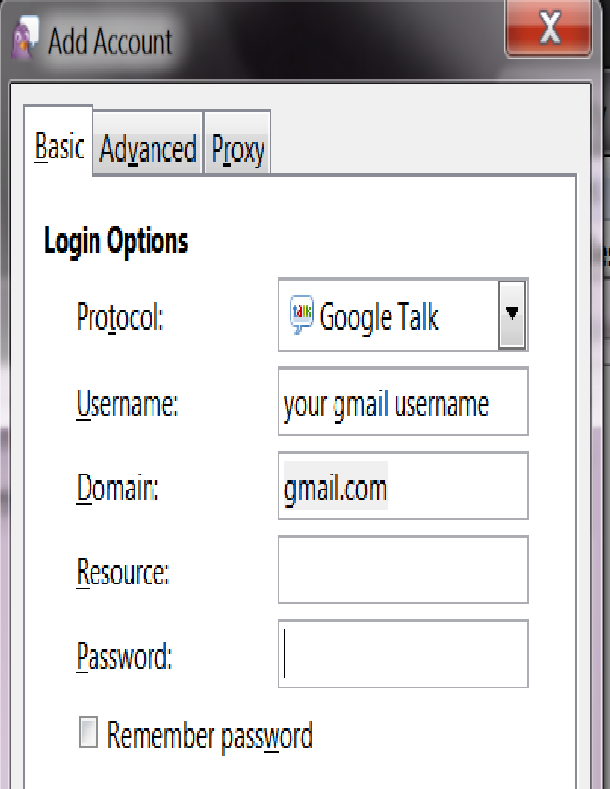 We will use this client find out and force sign-out those ‘ghosts’ of your Gtalk! 4. 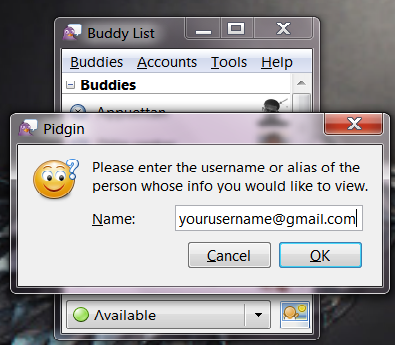 Click on ‘Buddies‘ and select ‘Get user info‘ or you can just press Ctrl+I. This will give you a pop-up window as shown below. Type your gmail address in it and click OK.
As you can see, this account has currently got 3 active session running (including the one from pidgin). Note the IDs given for the “Resource” entry. Copy the whole content into a notepad/word file. All these IDs indicate a specific device/client in which google talk is active. 6. Now Close this window. Click ‘Manage Accounts‘ and then select your account and delete it. 8. Now, once you are in the main window of the application, set your status as ‘Offline’. Sign into gmail and try to set your status as invisible. If you are not getting the ‘oops…’ message, then you have done it! If you are sill getting it,then follow the above step with the other resource ids that you have seen (which you should have copied into the notepad/word file). Try them one-by-one till you are able to set your status as invisible in gmail chat. Thanks to Keith for this helpful suggestion. Google just did a stupid thing recently. They replaced Google Talk app for Android (and iOS) completely with the new Hangout app. And why exactly is this stupid?? Here is the answer from me (people may differ). 1. I can not see which of my friends are online..In Talk, I used to see a green/red/yellow icons next to their names so that I know their status (available/busy/idle, respectively). With the new Hangout app, I am completely blind about this..heck, I don;t have any idea about who’s online. 2. I can’t set my status (available/busy) in Hangout. Forget about being invisible – that’s not at all possible which means you are exposing yourself to that nagging friend/co-worker of yours! How do I get back my Talk app?? I can’t find it in Play Store..
“We’re upgrading Gmail video chat to Hangouts for all Gmail users over the course of the next few weeks. If your account has already been upgraded, there isn’t a way to return to the old video chat, as we are now going to be using a more modern video calling technology. “I’m sorry to say but Hangouts is going to replace talk at all once it has been rolled-out globally. Don’t worry that much about who’s online or offline, the great thing on Hangouts is, your messages are delivered for sure – no matter if the person is online or offline! However, on your mobile you see friends that are currently not “online” at that time grayed out. Online members are displayed in “full” color and on the web extension you’ll see a green line below their photo. Yeah, really that was ‘really helpful’. So, THIS is WHAT you SHOULD do TO GET BACK YOUR TALK APP in ANDROID phone. BTW, I am using and HTC device. 1. Go to Settings and then to Applications. 3. Select ‘ALL’ to see the list of all the applications installed in your phone. 4. Scroll down and find the ‘Hangout’ app. 7. You will be asked to confirm your command, say yes. Now, go back to where you saw ‘Hangout’ app in your device and voilà!! there the old Talk guy sitting!! Liked this article!? See more Android tricks and tips here.